Can a Felon Get a Car Loan? Jobs are difficult for felons to find because of their conviction, placing even more pressure on felons who are trying to support a family. For those felons that do find employment, they usually need a vehicle to get back and forth, meaning they need to buy a car if they don’t already have one. 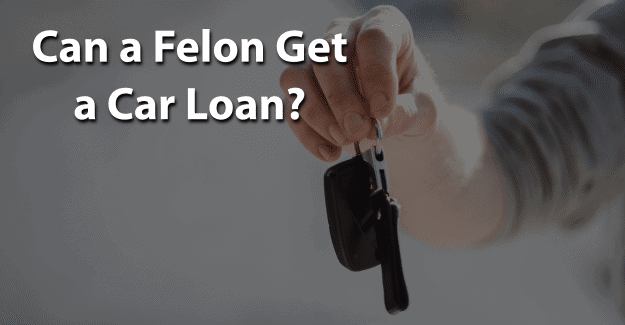 This blog post will cover the issue of whether or not a felon can get a car loan. When someone is trying to buy a new car there were two considerations that are important. These are finding a car that meets their needs and deciding how to pay for it. Unless someone is able to pay cash for a car, he or she will have to take out a car loan. More than 85% of new car purchases and 53% of used car purchases involve a loan. A car loan offers someone the money he or she needs to pay the seller of the car for the vehicle. The amount of the loan is called the principal. The cost of borrowing the money is called interest. The interest rate shows the percentage of the principal that is owed to the lender. The term of the car loan is the amount of time someone has to pay back the lender, usually expressed in months. The term of loan can be as long as seven or eight years, especially for a new car. When looking for a car loan it’s important to be willing to apply to multiple lenders. While the application may be somewhat involved, there’s a better chance of getting a loan when applying to more than one loan source. The potential lender will pull someone’s credit report in order to know his or her credit score and whether or not he or she is a good candidate for a loan. Sometimes car loans are denied. When this happens the lender is legally required to provide the reason for being declined. If it is due to a mistake, this can be corrected. If the loan is declined for a valid reason, it can help to ask the lender what needs to be done to qualify for a car loan in the future. Sometimes, the lender can restrict the use of a purchased vehicle. Some lenders will not make car loans for vehicles intended to be used by a shared ride company such as Uber or Lyft. For those intending to use a new car for business purposes or for a ride-sharing company, it is important to inform the potential lender of this intention. Even after finalizing the purchase of a car, that vehicle still belongs to the lending institution until all payments have been made. That means that the title to the car will remain with the lender until the loan has been paid in full. When someone gets behind on payments and is unable to continue to make them, the lending institution is allowed to repossess the vehicle. Identifying information. This includes Social Security Number, birthdate, and employment status. Trade lines. These are the credit accounts, including type of account, date account opened, credit limit, account balance, and payment history. Credit inquiries. This is a list of everyone who has accessed this credit report in the past two years. Public record and collections. This is public record information from state and county courts and information on bankruptcies foreclosures, liens, and judgments. The credit area is one that many felons have difficulty with and typically is the main reason to be denied such things as a car loan, homeowner’s insurance, or renter’s insurance coverage. Having been in prison, unemployed, and unable to find a job puts most felons in a precarious situation. Their financial history may include a bankruptcy because of the inability to meet their obligations, especially during incarceration. There are resources available to help get rid of debt. Felons have a difficult time financially and especially in getting a loan, even for a car. Once a lender finds out about a criminal record, the lender may reject the loan application. The more serious the felony, the more likely it is that the loan application will be denied. This decision is up to the individual lender. In addition to a criminal record, the credit score course makes a significant difference in obtaining a car loan. A felony conviction plays no part in an individual credit rating. Being incarcerated and away from someone’s family can cause debts to mount up easily. One of the factors that plays a part in getting a car loan approved is a felon’s current income. But with the difficulty a felon has in getting a job, his or her current income will be significantly impacted by this struggle. There are steps that can help repair their credit and improve their chances of qualifying for a car loan. One of the first things is to have a steady source of income, which felons know can be a major obstacle. Make certain the information used in the credit report is accurate. Incorrect information can lead to more difficulties in raising a credit score. It’s important not to open new accounts or get new credit cards. If an account is opened, keep it to that single account without establishing others are the time. Closing an account with an outstanding balance will not wipe it out; it will still show up on a credit report for seven years. It’s important to be honest when filling out an application to apply for a car loan. If a felony isn’t disclosed but is found on a background check, this constitutes fraud and is punishable. It’s a crime to falsify an application, which could result in being sent back to prison. In order to be successful in getting a car loan, it’s essential for felons to be honest about their background. They are already seen with negative perceptions of being dishonest, untrustworthy, and unwilling or unable to follow directions from authority figures. Having their record expunged can give them the chance needed to begin with a clean record and succeed in getting a car loan. Expunging a criminal record allows anyone to honestly state on a loan application that he or she has not been convicted of a crime. It’s a big challenge, but it might be worth it for a felon wanting to get a car loan. Having his or her record expunged and also documenting any training programs or additional education could make the essential difference in a felon succeeding in getting a car loan. What do you think about this blog post? Have you or someone you know been in the situation of trying to get a car loan with a felony? What was that like for him or her, and how did he or she achieve success? Please tell us in the comments below.